The first time I came along the distinction between "complex" and "complicated" was in Jurgen Appelo's Management 3.0: The difference is that the outcome of complicated systems is still predictable, while that of complex systems is not. In our age of connectedness and rapid change we have to deal with complex systems more often than maybe a hundred years ago, when most of today's management ideas were conceived. There is nothing wrong with these management ideas, but they were created to target complicated systems exclusively, which are now mostly obsolete. This is where Niels Pflaeging and his new book "Organize for Complexity" enter: The author proposes a whole new approach to management. 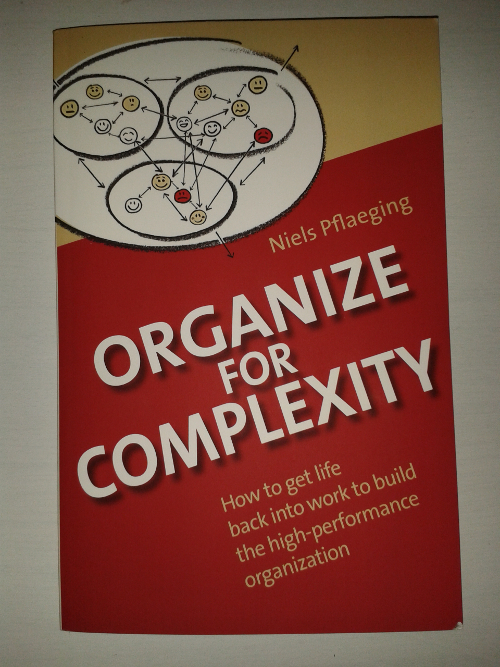 In six chapters, Niels Pflaeging first sets the stage with useful vocabulary and concepts, and then describes steps needed in order to transform organizations, in order to make them evolutionary fit for today's complex conditions. He emphasizes that a hierarchical structure is no longer a sensible way to organize a company - complex systems can only be tackled by networks in which new connections are more easily created and abandoned. You can feel that the author is very good at energizing people and motivating them to become change agents. His optimism is infectious and makes reading the book a great experience. At a first glance, the appearance of "Organize for Complexity" is refreshingly different: it avoids lengthy text descriptions and relies more on hand-drawn illustrations, like diagrams and graphs. By this, Niels Pflaeging manages to get a lot of content in roughly 120 pages. In general, this style made the book easy to read, but I realized the underlying thoughts turned out to be much deeper than they appeared to be, and I felt that due to the brevity I was turning pages faster than my brain could process all these ideas. The illustrations also started to feel repetetive (there are a lot of similar looking network graphs) and the effect of freshness wore off, the chapters seemed to blend into each other and in the end it was hard to get the gist of the book. So while "Organize for Complexity" covers a lot of great and progressive ideas (and is told in a uniquely energetic way), it lacked a narrative and dynamics. It felt to be just the sum of its parts. But when the parts are this good, the outcome is still a highly relevant and recommendable book.